Servian author; born at Belgrade, Servia. He left his home in 1813 in consequence of the invasion of the Dahjas, and settled at Vienna, where he edited the Ladino translation of the Bible, the daily prayers, and other ritual works, as well as school-books. Returning to Belgrade toward 1838, he devoted himself to Jewish, especially to Judæo-Spanish, literature. 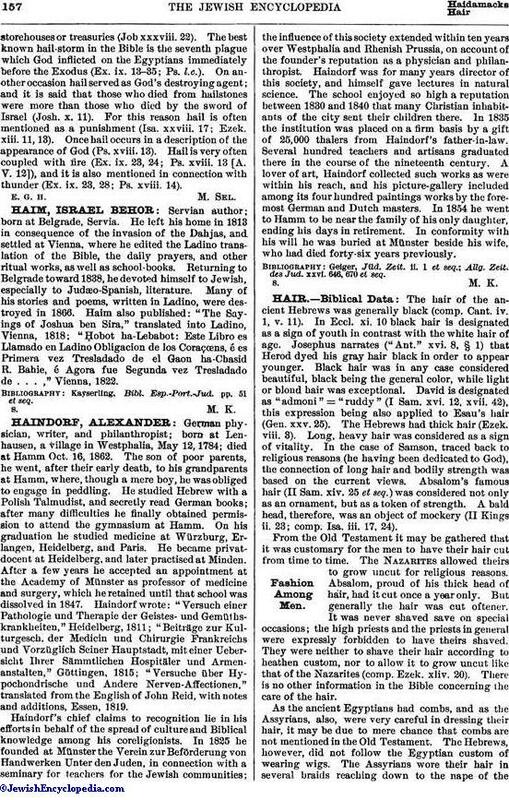 Many of his stories and poems, written in Ladino, were destroyed in 1866. Haim also published: "The Sayings of Joshua ben Sira," translated into Ladino, Vienna, 1818; "Ḥobot ha-Lebabot: Este Libro es Llamado en Ladino Obligacion de los Coraçœns, é es Primera vez Tresladado de el Gaon ha-Chasid R. Bahie, é Agora fue Segunda vez Tresladado de . . . ," Vienna, 1822. Kayserling, Bibl. Esp.-Port.-Jud. pp. 51 et seq.